It’s a new year and your boss has just handed out your team’s performance goals. They’re ambitious. As the sales leader, it’s all on you. You’re stressed. So, you go to the gym and work out, hoping you can at least make headway on that New Year’s resolution. And you wonder, wouldn’t it be great if you had a performance coach who could help you with your team’s goals? 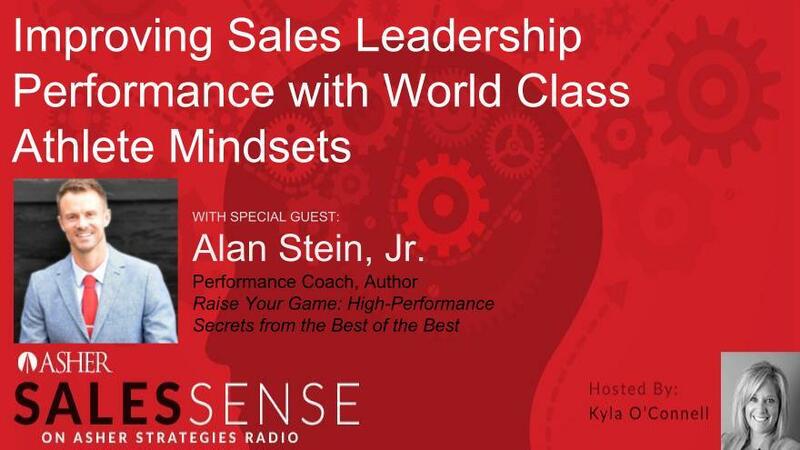 On the January 17 Asher Sales Sense Podcast, Alan Stein Jr will reveal the performance secrets of world-class athletes and how they can inspire and empower you and your team to take immediate action and improve mindset, habits, and productivity. Alan worked as a performance coach with the highest-performing basketball players on the planet, including NBA superstars Kevin Durant of the Golden State Warriors and Victor Oladipo of the Indiana Pacers. He understands the principles of top performance, mental toughness, and consistent achievement and that whether on or off the court, the fundamentals of performance and achievement are identical. Listen in and learn how you can lead your sales team to victory in 2019. About our guest, Alan Stein, Jr.
Alan Stein, Jr. is a performance coach, consultant, speaker, and author of the recently published book, Raise Your Game: High-Performance Secrets from the Best of the Best. High achievers are at the top of their game because of the discipline they have during the unseen hours. They have made a commitment to establish, tweak, and repeat positive habits in everything they do. RAISE YOUR GAME examines the top leaders in sports and business and proves that success is a result of the little things we do all the time. After 15 years working as a performance coach with the highest-performing basketball players on the planet, such as NBA superstars Kevin Durant of the Golden State Warriors and Victor Oladipo of the Indiana Pacers, Alan understands the principles of top performance, mental toughness, and consistent achievement. Whether on or off the court, individual or collective development, the fundamentals of performance and achievement are identical. Alan teaches people and businesses how to use the same mindsets and habits as world-class athletes to achieve goals by using sports-proven strategies of closing the gap between what they know they should do and what they are actually doing. Alan delivers high-energy keynotes and interactive workshops to improve performance, cohesion, and accountability. He inspires and empowers everyone he works with to take immediate action and improve mindset, habits, and productivity.